Federal broadband grant programs start accepting applications in the spring. 2018 is an especially exciting year because the Connect America Fund (CAF) II Auction is finally open. This program has been years in the making, but it still has its flaws. Learn more about the federal grant opportunities and how we can improve federal broadband data below. At noon ET on March 19, 2018, the much anticipated CAF II Auction opened. Application are due by 6pm ET on March 30th, 2018. The Federal Communications Commission (FCC) will distribute $2 billion to Internet Service Providers (ISPs) to build new Internet infrastructure in rural areas. This auction is the latest program of the larger CAF program that started offering funds in 2012. In the past, most CAF funds have gone to the largest incumbent ISPs, such as Frontier or Verizon. This auction is a chance for small rural ISPs to win funding for their communities through innovative projects. Watch the FCC’s Application Process Workshop Video and then explore the map of eligible grant areas. The U.S. Department of Agriculture (USDA) also announced that the Community Connect Grant program is open. Webinar presentations on the process will be available on April 5th and April 10th. Applications are accepted through May 14th. Community Connect Grants are each $100,000 to $3 million and focus on improving rural broadband infrastructure. Areas are eligible if they do not have access to speeds of 10 Mbps (download) and 1 Mbps (upload). Nonprofits, for-profits, federally-recognized tribes, state governments, and local governments can propose projects. Winners must match 15% of the grant and the program has a budget of about $30 million. 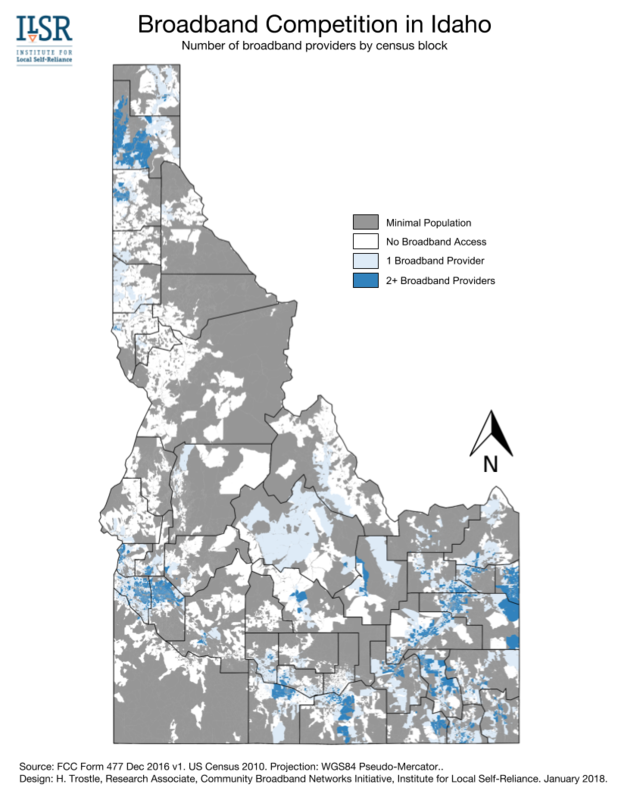 Like many other states, connectivity across Idaho is unequally distributed. Urban areas may have a choice of one or two broadband providers while many rural areas have no options whatsoever. We have compiled the latest data from December 2016 into a map to highlight competition and show these disparities. According to the Federal Communications Commission's (FCC) 2018 Broadband Progress Report, 98 percent of urban areas and 68 percent of rural areas in Idaho have broadband service, defined by the FCC as 25 Megabits per second (Mbps) downstream and 3 Mbps upstream. While about 1 million people in Idaho have access to two or more options, nearly half a million people are not nearly as lucky. Approximately 327 thousand of the state's 1.683 million people have only one option for broadband service, and 169 thousand still do not have access to broadband. This, however, is actually a best-case scenario. 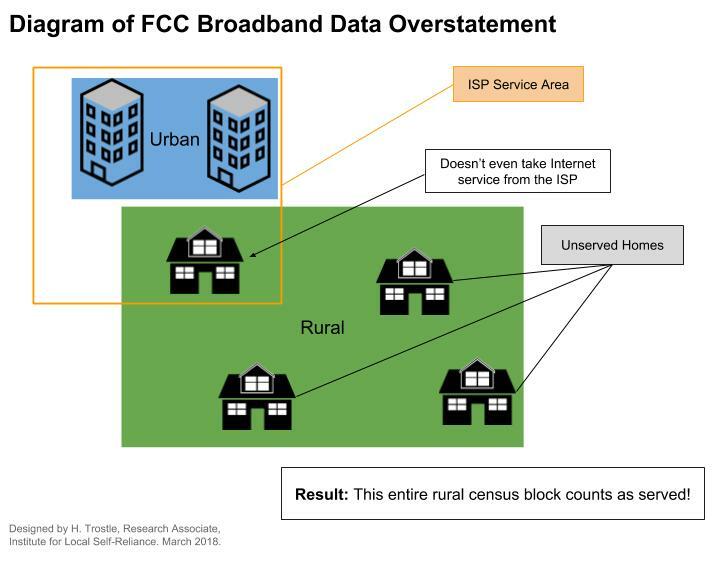 These statistics and this map, like most broadband data, rely on FCC Form 477. Internet Service Providers (ISPs) complete the form explaining which census blocks they serve or could serve. Census blocks are the smallest unit of measurement for the U.S. Census, and they vary in size. Rural census blocks often cover more land mass than urban areas. ISPs need only be able to offer service to one person in a census block in order to claim the entire census block. This can lead to an overstatement of how many people are actually served. The FCC launched an interactive map with this data, and FCC Commissioner Jessica Rosenworcel has invited people to submit corrections to broadbandfail@fcc.gov. Maple syrup, the Green Mountains, and network neutrality. On February 15th, Vermont Governor Phil Scott signed Executive Order No. 2-18, the Internet Neutrality in State Procurement, following closely the actions of four other Governors over the past few weeks. You can read the E.O. here. Like similar actions in Montana, New York, Hawaii, and New Jersey, Vermont’s executive order applies to contracts between ISPs and state agencies. The order directs the state Agency of Administration to change its procedures so that any ISP it contracts with doesn't throttle, engage in paid prioritization, or block content. The Agency of Administration has until April 1st to make the changes to Vermont’s procedures. If a state agency cannot obtain services from an ISP that agrees to comport with network neutrality policy, the state agency can apply for a waiver. The E.O. is silent as to what would allow a waiver; presumably the Agency of Administration would need to establish criteria. In early February, the State Senate passed S.289 with only 5 nays and 23 yeas. The executive order Scott recently signed reflected the intention behind the language of S.289 regarding state contracts. When Sen. Virginia Lyons introduced the bill, she described it as a necessary tool to ensure transparency in government. “We don’t want to see information held back or slowed down or deviated in any way when it relates to our state or local government,” Lyons said. After the FCC chose to overturn federal network neutrality protections on December 14th, 2017, open Internet advocates and elected officials that favor network neutrality have sought avenues past the Commission to reinstate the policy. In Louisiana, four groups of citizens organized together to form Team Internet and stage Louisiana rallies in four cities in January. Their goal was to bring attention to the overwhelming opinion that network neutrality benefits Internet users and to convince Senator John Kennedy that he should vote to block the harmful FCC decision. Fight for the Future (FFTF), Free Press Action Fund, and Demand Progress worked together to form Team Internet, which organized protests in Lafayette, Shreveport, Baton Rouge, and New Orleans at Kennedy’s offices. At the Lafayette office, a group of advocates led by Layne St. Julien presented petitions with more than 6,000 signatures to Kennedy’s deputy state director, Jay Vicknair. The petitions urged Sen. Kennedy to use his vote to overturn the FCC action. According to Vicknair, constituents have called and emailed the office in numbers rivaled only by last year’s healthcare debates. At the recent Team Internet protest, attendees called on Kennedy to “be a hero” and be the 51st. The U.S. Department of Housing and Urban Development (HUD) provided Community Development Block Grant funds (CDBG) to West Virginia as in other states. This year, the Community Development Division of the West Virginia Development Office that distributes CDBG funds will provide $1.5 million to local broadband projects that include planning and infrastructure. Last July, the state’s Development Office announced that it would accept applications for broadband projects. The decision was a departure from past practice of focusing only on water and sewer infrastructure. By the time the application period was closed, 12 potential projects had been submitted for consideration; those projects touch 27 counties and reach about 300,000 premises, many located in the southern part of the state. All twelve projects will receive some amount of CDBG funding. One of those applications was from the Region 4 council, in the hopes of obtaining $125,000 for planning to improve connectivity in Webster, Fayette, Greenbrier, Nicholas, and Pocahontas Counties. The state will provide the funding, which will potentially affect future planning for six more counties. Region 4 will collaborate with a similar initiative by Region 1, which will also receive $125,000. Another multi-organizational application came from Clay County, which plans to work with Calhoun and Roane Counties on a feasibility and business plan on how best to move forward to improve connectivity. Fayette County wants to use its award to map out where best to place fiber for maximum effect and Gilmer County will focus on planning to involve a local industrial park along with exploring other funding strategies. On January 18th, the FCC ended months of speculation and released a fact sheet that included several key conclusions to be included in the 2018 Broadband Deployment Report. The most important is that the FCC continues to recognize that mobile Internet access is not a substitute for fixed access. The Commission has also decided to leave the definition of broadband at 25/3 Mbps (down/up). The Commission had proposed reverting to a slower definition of broadband from the current standard of 25 Megabits per second (Mbps) download and 3 Mbps upload. Under Tom Wheeler’s leadership, the FCC decided to update the standard to its current definition in January 2015, but current Chairman Ajit Pai and other Republican Commissioners suggested in last year’s Notice of Inquiry (NOI) that the FCC might effectively take us backward to a 10 Mbps/1 Mbps standard. The suggestion rankled better connectivity advocates and Internet users. Many recognized that lowering the standards would make it easier for the FCC to proclaim that the U.S. was making strong progress toward universal household deployment. The Commission would have been justified making such a conclusion under the standard because large sections of rural American receive DSL, fixed wireless, satellite, or mobile Internet access that would meet a lowered 10/1 standard. Hundreds of thousands of people, organizations, and businesses filed comments opposing a slower standard. Many of them live in areas where 10/1 speeds are already available but who have been waiting for better options. Commissioners Rosenworcel and Clyburn also spoke out against the lowering broadband speeds. Ever since the FCC reversed network neutrality protections, an increasing number of local communities have started to wonder about the advantages of publicly owned Internet infrastructure, including conduit. At the Institute for Local Self-Reliance, we’ve received an uptick in requests for information from elected officials, community business leaders, and local citizens. When folks are similarly curious about public-private partnerships, they wonder about whether or not a municipality or other form of local government can require a private sector partner ISP to adhere by the tenets of network neutrality. An agreement between public and private sector partners to bring better connectivity to a city or region is a contract between the involved parties; the FCC’s decision won't interfere. Lincoln, Nebraska, has fine-tuned the art of working with private sector partners interested in using their publicly owned conduit for privately owned fiber. The city invested in an extensive conduit system back in 2012 to create an environment that would welcome private sector providers. Nelnet’s ALLO Communications uses the conduit to offer Fiber-to-the-Home (FTTH) in Lincoln. 1.Net Neutrality: In the provision of Broadband Service, Franchisee shall comply with the Open Internet regulations.